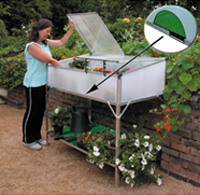 Give your vulnerable young plants the best start in life with this top quality coldframe and stand. Ideal for protecting plants from late spring frosts and bad weather in winter. Constructed from aluminium and made to last and last. The twin top panels - (in child safe Polycarbonate) have adjustable opening to allow easy access from table height and prop open for varying degrees of ventilation. The Cold frame floor has New PVC Thermal Boards for additional insulation helping to keep those roots warm. 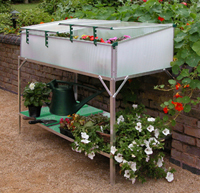 Also 6 sections of thermal board are used for the handy utility shelf underneath, ideal for storage or hardening off young plants on those warmer days.